Little Sweet Potato has lived peacefully in his garden patch until vibrations from a tractor shake him loose from his vine and toss him onto a road. Wondering how to get back home, he bravely rolls to another garden, occupied by resident carrots who wiggle “their long orange bodies,” call him “lumpy, dumpy, and…bumpy” and reject him. Little Sweet Potato resolutely continues to another patch, where handsome eggplants with satiny skin refuse him because of his “dumpy, bumpy, and kinda lumpy” appearance. 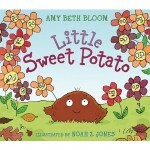 At the next garden, flowers with “velvety blue and yellow faces” shun Little Sweet Potato because he’s a “lumpy, bumpy, dumpy vegetable.” Following similar receptions from the grapes and squash, Little Sweet Potato is about to give up when he’s welcomed into a garden teeming with all kinds of plants who praise his lumpy, dumpy, bumpy figure. 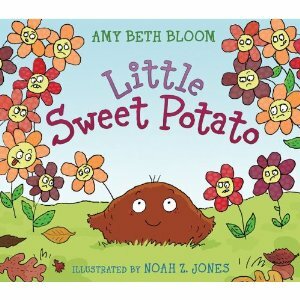 Rendered in strong black outlines and bright colors, the comical illustrations track Little Sweet Potato’s solitary roll across sequential double-page spreads. Cartoonlike, anthropomorphic veggies, fruits and flowers add humor with their hilarious expressions, ranging from haughty and scornful to enthusiastic and approving. Accidently uprooted from his garden patch, a sweet potato is repeatedly excluded from other gardens before landing in just the right place.